Construction of the hoops for a polytunnel over the melon house began this month, and a sturdy tarpaulin was stretched over the peach house roof to protect it. Volunteers celebrated our 1st birthday with tea and cake. During our first year over 3000 volunteer hours have been recorded. 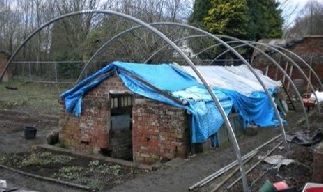 A good number of volunteers turned out to help put the polytunnel cover over the melon house so that conservation and restoration of this increasingly rare example of Victorian ingenuity can start. 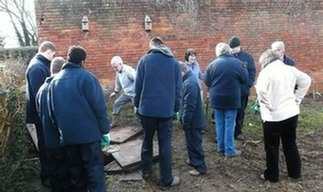 A local school group visited us and helped in the garden. 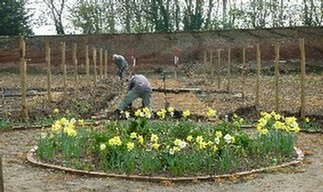 The first 18 fruit trees were planted against the walls and espaliers. 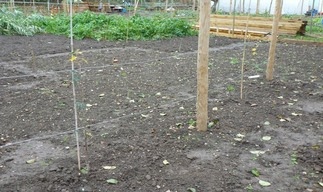 The final espalier posts were put in and all the wiring completed. Some of our first early potatoes were planted. 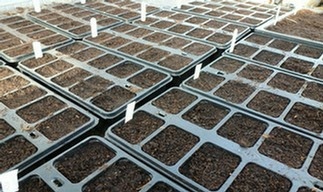 Seed sowing began in earnest. 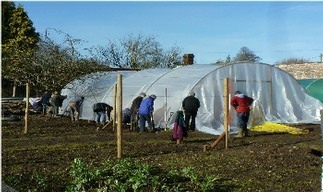 A small greenhouse was erected to help with propagation. Work started on digging the trenches for the irrigation system. 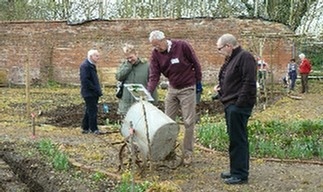 We had a very successful open day on Easter Sunday, with 96 visitors. 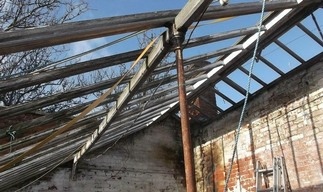 Many seemed genuinely interested in the restoration project. The irrigation trenches were finished ready for the pipework. 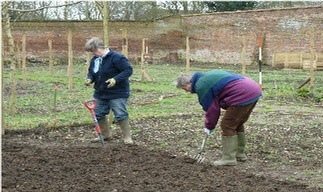 Volunteers were working hard to dig over all the beds ready for the first year of planting. 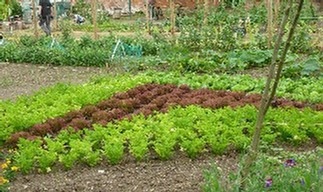 A great deal of sowing and planting going on this month all around the garden. Our problem weed - horsetail - showing itself all over the place. Another successful open day with nearly 100 visitors. The pipework for the irrigation system was laid in the trenches, ready for the taps to be fitted. 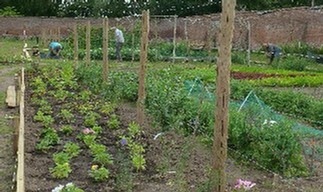 All the main beds planted up. 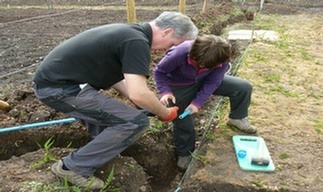 The taps for the irrigation system were fitted. 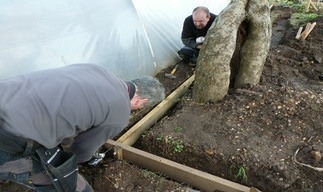 Work began on putting in the edging boards for the pathways around the garden. We have bought a small tiller to help us keep the beds and unplanted areas under control. 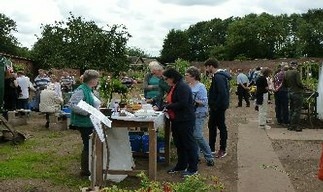 Our produce was on sale for the first time at our successful July open day. The irrigation system was completed this month. Work continued on the path edging boards. This is a major project which will take our volunteers some time to complete. 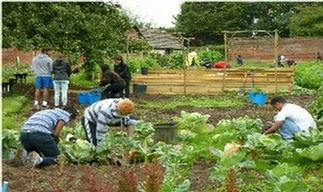 Young people from the Challenge Programme came to help in the garden as part of their course. 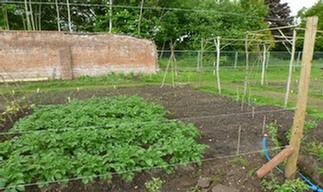 Everything is growing well and we are picking plenty of produce to sell. We opened the garden for two days as part of the Heritage Open Day scheme, This was a tremendous success with well over 500 visitors coming to look at our progress. 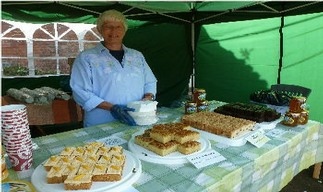 We had a refreshments stand with all the cakes, which were highly praised, made from produce grown in the garden. 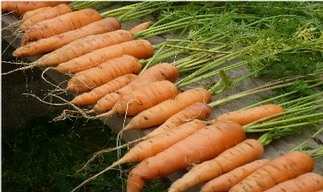 We also sold a great deal of our freshly picked vegetables. 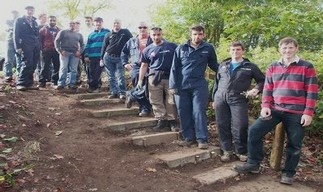 The Community Action Day team from National Grid had an away day in the garden and built a set of steps to improve the safety of access, and they relocated the compost bins so we can extend them..
We continued to harvest many of our crops to sell from the Hintons shop. Work progressed on the path edging. 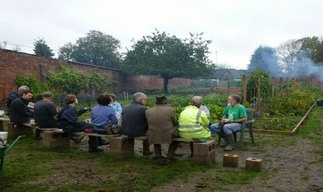 Work began to get the garden ready for winter, clearing the beds and sowing green manure for digging in next year. Over the year we had accumulated a very large pile of horsetail, a pernicious weed. This cannot be composted and so it was all burned on our Guy Fawkes’ day bonfire. We were very glad to see the back of it. 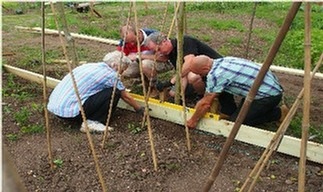 By the end of the month the path edging team had finished edging the beds and borders. A great job, transforming the look of the garden. The warm weather meant many plants thought it was spring and started to grow again. 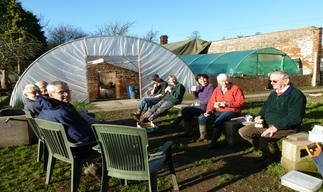 On our last volunteer day of the year, 29th December, we sat outside in the sunshine eating our lunch.